Looking for a way to keep track of your child’s activities while you’re not at the home? Hand the child care checklist to your baby sitter and get a detailed report upon your return home. The child care checklist can also help the baby sitter provide your child with the best care possible. You can download the child care checklist from for free simply by clicking the link on this page! 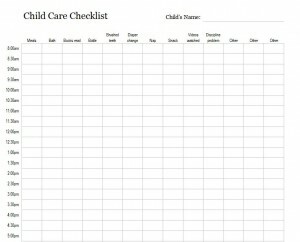 The child care checklist comes in the form of a Microsoft Excel template. The first step in using the template is to add your child’s name. Alongside the child care checklist vertically is a 14-hour window beginning with 8:00 a.m. and ending with 10:00 p.m. If you will be away from your child at different hours, feel free to alter and customize the child care checklist to best meet your needs. As the day progresses, the babysitter will mark what happened in the box that corresponds with the time of day. For example, if your child had a discipline problem at 8:00 p.m., the sitter would mark and X in the 8:00 p.m. box in the discipline problem row. It’s just that easy! There’s three additional rows on the child care checklist marked “Other.” These can be changed to things such as played outside, spent time coloring or anything else you can think of that you would expect your child to do. The template is completely customizable. It could be printed off for the sitter or could be saved on the computer and the sitter can input information that way. Get a full run down of what your child does when you’re not there with the child care checklist from Microsoft. Download it for free today!